We had potluck party last week and this was the dish I made for the party. 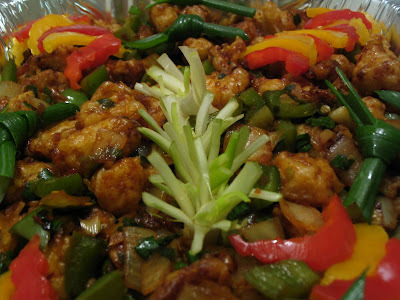 Gobi manchurian everyone favourite dish in which sweet little cauliflower are dipped in the batter and takes oil bath and dressed with yummy sauce. Who dont love this.... here is the recipe how I prepare. 1. Seperate cauliflower into medium sized pieces wash and drain. 2. Now mix cornflour, allpurpose flower, ginger+garlic paste salt and pepper with water thicker then dosa batter. 3. Now add the florets in the batter so that they should be well coated. If it is still loose dust again with cornflour. 4. Heat oil for deep frying pan. When oil is ready deep fry them till crisp and drain it in the tissue. 5. Now cauliflower are ready. 1. Mix all the sauces in a bowl. 2. In frying pan heat 1 tbsp oil and fry the chopped garlic and green chilli. 3. Add the sauces and vinegar saute well. 4. Now mix the cornflour, water and make a paste. 5. Add it to sauce and mix well so that cornflour changes to transparent colour. 1. In a wok heat a tbsp of oil and fry chopped ginger and garlic slightly. 2. Now add the chopped onion saute until they are half done, add capsicum saute lightly. 3. Add the prepared sauce and deep fried florets mix well and give a good toss. 4. Sprinkle white pepper powder just for taste and garnish with spring onions. 5. Serve hot with fried rice, noodles or as an appetizer. 2. Mix the sauce and florets only at the time of serving otherwise they becomes soggy. 3. When I prepared for potluck I made sauce and deep fried florets ahead of time. 4. Just before serving I reheated the florets in the oven until crisp and I did the remaining process. 5. 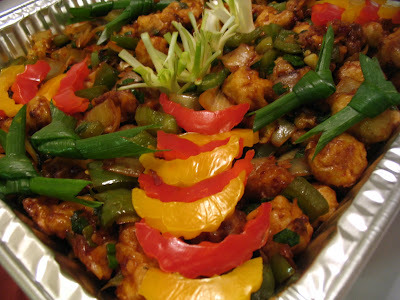 Cauliflower can be substituted by mushroom, Vegetable balls, Chicken, paneer, babycorn. 6. Cornflour and water mixture can be adjusted accordingly for making sauce. Depends on how we need it like dry or saucy. beutiful presentation..nice garnishing as usual..looks super yumm!! 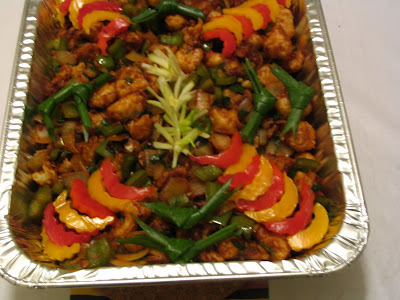 Very good pot luck -Dish..I bet you got more compliments in the pot luck party.. Very colourful and nice presentation! Great one Pavithra! A very tasty looking dish! I love the presentation! for ur lovely comments and words. OMG u surely know how to decorate food!!!! Thanks for ur wonderful comment,awaiting for more. I'm making this dish for a get-together. I'll be making it during lunch time and dish will be served for dinner. Any ideas to prevent sogginess. Also how many mins to reheat fried cauliflower to make it crisp again. 1. As I specified in the notes, make sauce and fried florets ahead of time(during your lunch time), Even you can saute all the second fry item in the list ahead of time and keep it a box. 2. When You are ready to serve preheat the oven to 300 f , heat the fried florets for about 10 to 15 minutes, see if it is stiff and crisp, if not keep 2 minutes extra. Then mix sauce, the items that is mentioned in the second fry , florets and serve immediately. 3. You can also reheat the sauce in the microwave too. You need not do all these mixture in stove top. Garnish with the spring onion finally. Thanks a lot Pavithra. Appreciate your help. Btw i tried this recipe at home and we loved it. Looking forward to serve it to guests.